Vimalamitra was born in western India and grew up to be a great scholar. He was living in Bodhgaya with five hundred other scholars when he met Jnanasutra, and the two quickly became close friends. While they were out walking one day, Vajrasattva appeared in the sky and pointed out that they had achieved nothing through their five hundred previous rebirths as scholars. If they aspired to reach Buddhahood in this lifetime, they should go to China to find their master, Shri Simha, at the Bodhi Tree Temple. Vimalamitra immediately set out for China and, in accordance with Vajrasattva’s prediction, found Shri Simha. He received the Outer, Inner and Secret cycles of Dzogchen Me-ngagde teachings from Shri Simha, remaining with the master for twenty years. When asked by Shri Simha if he was completely satisfied, Vimalamitra replied that he was; and he subsequently returned to India, receiving neither the Innermost Secret Heart Essence section of Me-ngagde, nor any of the Me-ngagde texts. Upon meeting Jnanasutra, Vimalamitra related what he had received and accomplished and Jnanasutra immediately decided to travel to China to meet Shri Simha. Vimalamitra then spent years engaging in meditation and tantric conduct, until one day a dakini appeared to him and said that if he wished to receive deeper Nyingthig instructions he should go to the Bhasing charnel ground. Travelling to Bhasing, he met his old friend Jnanasutra who, through his time with Shri Simha and the Dzogchen instructions he had received, had become a highly accomplished adept. Vimalamitra developed unshakable faith and begged Jnanasutra to impart the instructions he himself had missed. Jnanasutra then transmitted the empowerments, instructions and texts of the four sections of Me-ngagde to Vimalamitra, who practiced each stage with great diligence, bringing forth all the signs of realisation and accomplishment. Vimalamitra remained with his master for a further fourteen years, until Jnanasutra passed away in a rainbow body, leaving his disciple with his final legacy, the Zhakthap Zhipa (The Four Methods of Resting) in a tiny jewelled casket. Upon receiving these verses, Vimalamitra instantly achieved realisation equal to that of his master. He then spent years practising and teaching in charnel grounds in western India, leading large numbers of dakinis and humans to accomplishment. All the while his own realisation was becoming vast, until he attained the ‘light body of great transformation’ and led three thousand disciples to enlightenment. He then dwelled in Prabhaskara charnel ground for around thirteen years, appearing in different manifestations. Here he also made three copies of the texts he had received from Jnanasutra, concealing two in secret places and entrusting the third to the dakinis in Prabhaskara. A little while later, when Vimalamitra was serving amongst the five hundred scholar-preceptors of King Indrabhuti of Serkya, he received an invitation to Tibet from King Trisong Detsen. The Tibetan King had sent his emissaries, the translators Kawa Paltsek and Chokro Lui Gyaltsen, to invite a great master and translator to aid him in establishing the Dharma in Tibet. Vimalamitra was chosen and accepted the invitation, though many people witnessed signs that the dakinis were displeased at his departing India. This caused some people to try and stir up trouble and doubt in the minds of the Tibetans at Samye. However, such fears were allayed when Vimalamitra demonstrated the power of his realisation by instantaneously destroying and then restoring a statue of Buddha Vairochana, making it even more resplendent. 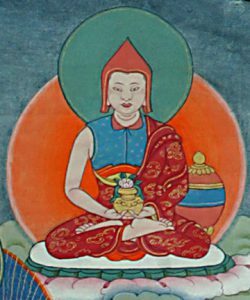 Yudra Nyingpo was accordingly requested to teach alongside Vimalamitra, and they subsequently found their teachings and realisation to be identical. Regretting their decision to exile Vairotsana, the King and ministers invited him to return to Samye. Together with a number of other translators, Vimalamitra then spent thirteen years translating the Inner Tantras of Mahayoga, Anuyoga and Atiyoga. In particular, the Nyingthig (Heart Essence: the Innermost Secret section of Dzogchen Me-ngagde) teachings brought to Tibet by Vimalamitra became known as the Vima Nyingthig. Having concealed the translated texts at Gekong in Chimphu, near Samye Monastery, Vimalamitra departed for Wu T’ai Shan (The Five Peaks) in China. Because he had already attained the rainbow body of great transformation, Vimalamitra stated that he will remain at Wu T’ai Shan until the Dharma ceases to exist, whereupon he will attain complete enlightenment at Bodh Gaya. He vowed to send an emanation of himself each century, in order to continue his activity of disseminating the Nyingthig teachings. It is said that even now, those of sufficiently high spiritual maturity can see and even meet Vimalamitra at Wu T’ai Shan.